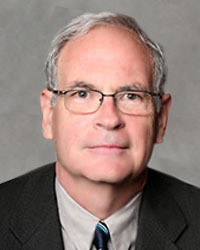 Dr. Orr is the Tulloch professor of genetics in the department, directs the Institute of Translational Neuroscience, and is a member of the Division of Molecular Pathology and Genomics. His research is focused on the molecular genetics of neurodegenerative diseases, principally the autosomal dominant form of spinocerebellar ataxia (SCA1). Patients usually develop SCA1 in mid-life. They experience loss of motor coordination and develop slurred speech, spasticity, and cognitive impairment. These symptoms arise from the loss of Purkinje cells and damage to other nerve cells in the brain’s cerebellar cortex. Orr and his colleagues cloned the SCA1 gene and found that the disease is caused by the expansion of an unstable, repeated cytosine-adenine-guanine (CAG) sequence in DNA. The length of the trinucleotide repeat is associated with when symptoms develop. The trinucleotide repeat encodes an expanded polyglutamine tract, an important step in disease pathogenesis. Orr and his colleagues established the first transgenic mouse model for SCA1 with which they were able to induce ataxia with Purkinje cell features characteristic of SCA1 by inserting CAG repeats. The model has helped his team understand how the SCA1 mutant polyglutamine protein, ataxin-1, moves from the cytoplasm into the nucleus of Purkinje cells where together with other protein complexes it causes Purkinje dendrites to atrophy. They found that phosphorylation of a specific ataxin-1 serine results in greater stabilization of the mutant protein, which alters the normal ratio of stabilized versus degraded protein and results in aberrant binding and disease. In the experimental therapeutics arena, Orr and colleagues are using RNA interference (RNAi) and adeno-associated virus (AAV) vectors as a delivery system to reduce ataxin-1 expression in Purkinje cells. Orr also working with a company that has developed anti-sense oligonucleotide chemistry. Anti-sense oligonucleotides act at the level of messenger RNA before proteins are produced. Delivering drugs to the central nervous system is difficult. Delivering molecular therapies to the deep cerebellar nuclei of the cerebellar cortex, where Purkinje neurons cluster and terminate, is a significant challenge. Orr’s University colleagues have experience using AAV vectors to deliver genes to Purkinje cells. When human trials begin, the hope is that a sufficient number of therapeutic molecules will be taken in by Purkinje cell terminals and transferred to the cell bodies to be beneficial to patients. Rubinsztein DC, Orr HT. Diminishing return for mechanistic therapeutics with neurodegenerative disease duration? : There may be a point in the course of a neurodegenerative condition where therapeutics targeting disease-causing mechanisms are futile. Bioessays. 2016 Oct;38(10):977-80. doi: 10.1002/bies.201600048. Ingram M, Wozniak EA, Duvick L, Yang R, Bergmann P, Carson R, O'Callaghan B, Zoghbi HY, Henzler C, Orr HT. Cerebellar Transcriptome Profiles of ATXN1 Transgenic Mice Reveal SCA1 Disease Progression and Protection Pathways. Neuron. 2016 Mar 16;89(6):1194-207. doi: 10.1016/j.neuron.2016.02.011. Malhotra D, Linehan JL, Dileepan T, Lee YJ, Purtha WE, Lu JV, Nelson RW, Fife BT, Orr HT, Anderson MS, Hogquist KA, Jenkins MK. Tolerance is established in polyclonal CD4(+) T cells by distinct mechanisms, according to self-peptide expression patterns. Nat Immunol. 2016 Feb;17(2):187-95. doi: 10.1038/ni.3327. Lasagna-Reeves CA, Rousseaux MW, Guerrero-Munoz MJ, Vilanova-Velez L, Park J, See L, Jafar-Nejad P, Richman R, Orr HT, Kayed R, Zoghbi HY. Ataxin-1 oligomers induce local spread of pathology and decreasing them by passive immunization slows Spinocerebellar ataxia type 1 phenotypes. Elife. 2015 Dec 17;4. pii: e10891. doi: 10.7554/eLife.10891. Dell'Orco JM, Wasserman AH, Chopra R, Ingram MA, Hu YS, Singh V, Wulff H, Opal P, Orr HT, Shakkottai VG. Neuronal Atrophy Early in Degenerative Ataxia Is a Compensatory Mechanism to Regulate Membrane Excitability. J Neurosci. 2015 Aug 12;35(32):11292-307. doi: 10.1523/JNEUROSCI.1357-15.2015. Lasagna-Reeves CA, Rousseaux MW, Guerrero-Muñoz MJ, Park J, Jafar-Nejad P, Richman R, Lu N, Sengupta U, Litvinchuk A, Orr HT, Kayed R, Zoghbi HY. A native interactor scaffolds and stabilizes toxic ATAXIN-1 oligomers in SCA1. Elife. 2015 May 19;4. doi: 10.7554/eLife.07558. Gennarino VA, Singh RK, White JJ, De Maio A, Han K, Kim JY, Jafar-Nejad P, di Ronza A, Kang H, Sayegh LS, Cooper TA, Orr HT, Sillitoe RV, Zoghbi HY. Pumilio1 haploinsufficiency leads to SCA1-like neurodegeneration by increasing wild-type Ataxin1 levels. Cell. 2015 Mar 12;160(6):1087-98. doi: 10.1016/j.cell.2015.02.012. Öz G, Kittelson E, Demirgöz D, Rainwater O, Eberly LE, Orr HT, Clark HB. Assessing recovery from neurodegeneration in spinocerebellar ataxia 1: Comparison of in vivo magnetic resonance spectroscopy with motor testing, gene expression and histology. Neurobiol Dis. 2015 Feb;74:158-66. doi: 10.1016/j.nbd.2014.11.011. Sieber BA, Landis S, Koroshetz W, Bateman R, Siderowf A, Galpern WR, Dunlop J, Finkbeiner S, Sutherland M, Wang H, Lee VM, Orr HT, Gwinn K, Ludwig K, Taylor A, Torborg C, Montine TJ. Prioritized research recommendations from the National Institute of Neurological Disorders and Stroke Parkinson's Disease 2014 conference. Parkinson's Disease 2014: Advancing Research, Improving Lives Conference Organizing Committee. Ann Neurol. 2014 Oct;76(4):469-72. doi: 10.1002/ana.24261. Lagalwar S, Orr HT. Regulation of ataxin-1 phosphorylation and its impact on biology. Methods Mol Biol. 2013;1010:201-9. doi: 10.1007/978-1-62703-411-1_13. Review. Ju H, Kokubu H, Todd TW, Kahle JJ, Kim S, Richman R, Chirala K, Orr HT, Zoghbi HY, Lim J. Polyglutamine disease toxicity is regulated by Nemo-like kinase in spinocerebellar ataxia type 1. J Neurosci. 2013 May 29;33(22):9328-36. doi: 10.1523/JNEUROSCI.3465-12.2013. Park, J., Al-Ramahi, I., Tan, Q., Mollema, N. Diaz-Garcia, J.R., Gallego-Flores, T., Kang, H., Lagalwar, S., Duvick, L., Lu, H.-C., Lee, Y., Jafar-Nejad, P., Sayegh, L.S., Richman, R., Liu, X., Gao, Y., Shaw, C.A., Arthur, J.C.S., Orr, H.T. Westbrook, T.F., Botas, J., and Zoghbi, H.Y. (2013) RAS-MAPK-MSK1 pathway modulates ataxin-1 protein levels and toxicity in SCA1. Nature 498:325-331. For a complete list of Dr. Orr's publications, please see the National Library of Medicine's PubMed Search.